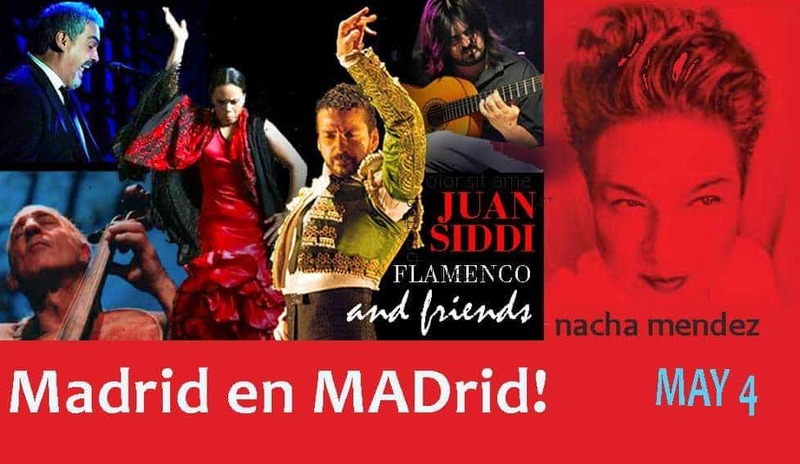 Mineshaft Tavern presents “Madrid en MADrid” Make it a FLAMENCO NIGHT! The Mineshaft Tavern is thrilled to present Juan Siddi Flamenco & Friends for an exhilarating performance in the Engine House Theater on Saturday, May 4, 2019 at 8:00 pm! Directly from Spain, the electrifying and award-winning Flamenco artist Juan Siddi makes his Madrid debut at this incredible historic theater with acclaimed dancer and choreographer Valeria Montes, world-famous guitarist Juani de la Isla, cello virtuoso Michael Kott, and the famed Gypsy Flamenco singer José Cortés. Don’t miss this unique opportunity to see these incredible artists performing right in the heart of Madrid, New Mexico. ​Voted Best Female vocalist in Santa Fe, New Mexico, the captivating NACHA MENDEZ performs Latin World Music during a special five-course Spanish dinner prior to the show. Hand-selected Spanish sherry and Spanish New World wines are available. Come hear Nacha and enjoy our special tapas dinner. However, to see Juan Siddi, get your tickets now before they sell out!